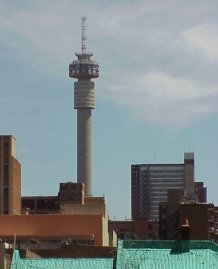 The Hillbrow Tower is the highest structure in Johannesburg, and is probably the city's most recognisable landmark. 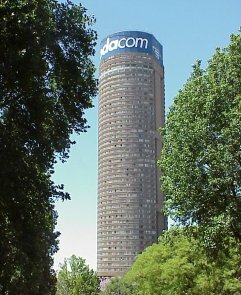 The Hillbrow Tower (previously known as the JG Strijdom Tower) was built over three years, between June 1968 and April 1971, and is 269m high. 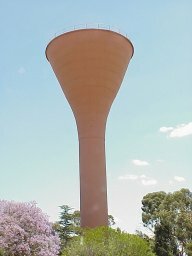 It is owned by Telkom (previously by the Post Office) and is used as a microwave tower. It used to boast a revolving restaurant, but was closed in January 1981 for security reasons. 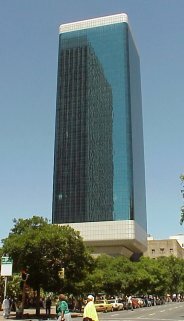 The tower had a blue illuminated Telkom sign installed on 31 May 2005, and was renamed as the Telkom Joburg Tower. 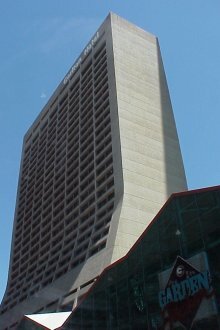 It is interesting to note that the height of the Hillbrow Tower is virtually the same as the length of the Titanic (269m). 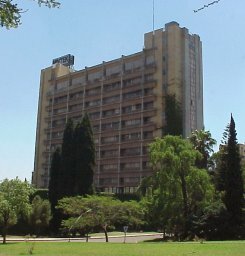 The Sentech Tower (also known as the Brixton Tower, and previously as the Albert Hertzog Tower) was built in 1962, and is 239m tall (other sources say 234m). 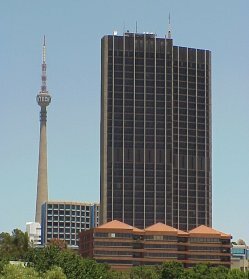 The tower is used by the SABC and Post office as a transmission tower, and is situated on a hill in Brixton. 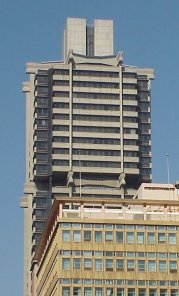 The Carlton Centre is the tallest building in Africa. (Note that the towers above are not strictly 'buildings'.) It was the tallest building in the southern hemisphere when originally completed. It has 50 floors, and is 223m tall, about 3m short of featuring in the world's top 100 skyscrapers. The foundations of the two buildings in the complex are 3.5m in diameter and extend 20m down to the bedrock, 30m below street level. The building houses both offices and shops, and has over 46 per cent of the floor area below ground level. 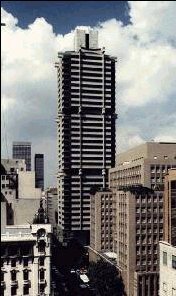 Excavations for the Carlton were started in January 1967, and took two years to complete. 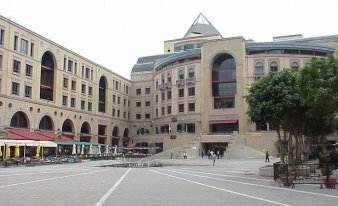 Although occupation of the Centre began in 1971, it was not until 1974 that most of the construction was completed - at a cost of over R88 million. It is possible (for a small cost) to take a lift (elevator) to the 50th floor, where there is a very good observation deck. 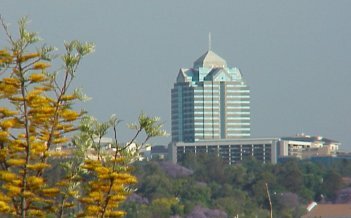 Built in 1976, the Ponte building has 54 floors, and has a height of 173.0m to the roof, and 185.0m to the pinnacle of the building. 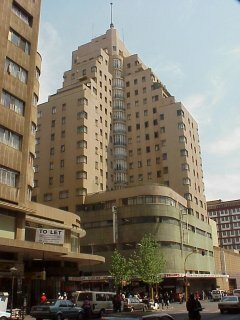 The Johannesburg Sun Hotel was re-opened in 2002 as the KwaDukuza Egoli Hotel. The name means 'Gathering Place in the City of Gold'. 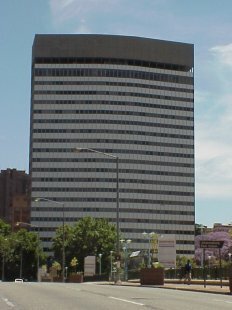 The Standard Bank building is unique in Johannesburg, in that it was built from the top down. After the central core was built, the floors were suspended from three cantilevered arms, with the top floors added first, followed by each lower floor. 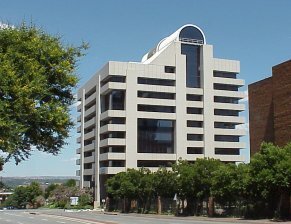 The building is organised into three hanging volumes of nine office floors each, with air conditioning plants housed between the sections. Photograph on right courtesy of www.joburg.org.za. The Carlton Hotel is 32 storeys high, has 602 rooms, and had 6 restaurants. The hotel has closed and the building is currently 'mothballed'. 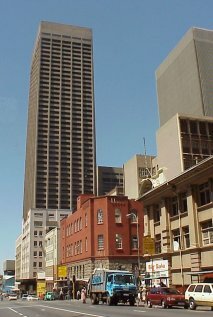 Ansteys Tower, located at 59 Joubert Street is now a national monument. 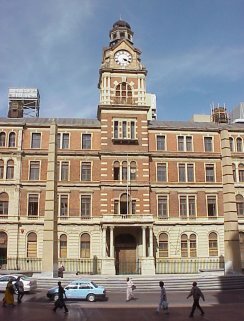 This building was once the home of Cecil Williams (actor, playwright, and member of Umkhonto we Sizwe). Nelson Mandela was disguised as Cecil Williams' driver when he was captured on 5 August 1962. 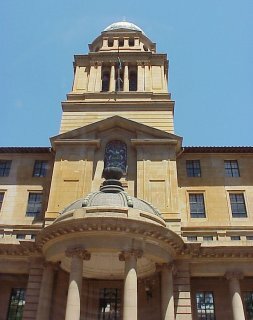 The old City Hall now houses the Gauteng Legislature. 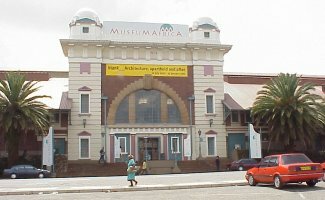 This is Johannesburg's oldest public building. 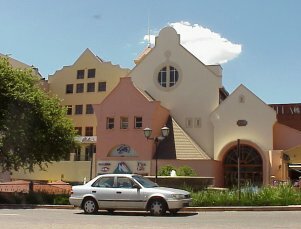 It was built in 1897, during the time of President Paul Kruger. The post office clock-tower in Rissik Street dates back to around 1900. At 294 m in length, this is the longest cable-stayed bridge in southern Africa. 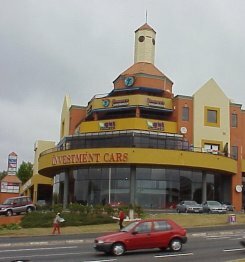 It was officially opened on Sunday 20 July 2003, with a road race to celebrate Nelson Mandela's 85th birthday. 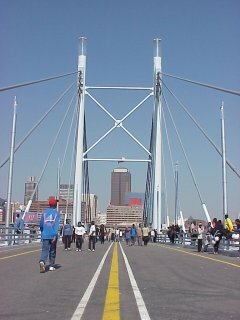 The bridge links Braamfontein to Newtown. 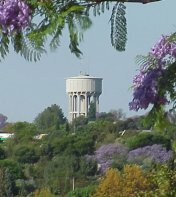 Northcliff Ridge is believed to have been inhabited by human beings for over 250 000 years. 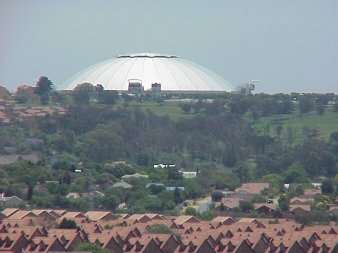 At 1807 meters above sea level, the ridge is only 1 metre lower than the highest point (Observatory Ridge) in the Johannesburg municipal area. The ridge has three unique vegetation zones, and is inhabited by numerous species of birds, small mammals, and reptiles. 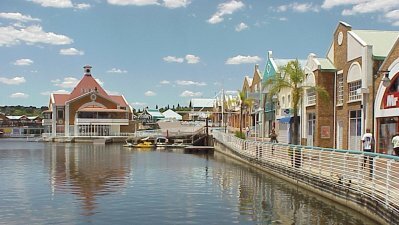 The Randburg Waterfront was relaunched in October 2003 as Brightwater Commons. Building height is measured from the sidewalk level of the main entrance to the structural top of the building. Television masts, radio antennas, and flagpoles are not included. 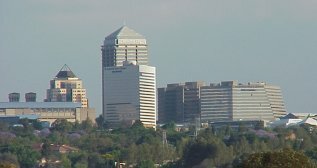 Although the Hillbrow Tower and Sentech Tower have been included in the list above for comparative purposes, they are not strictly 'buildings', as they are not habitable.